I made a basic fairy skirt to wear to a theme party about three years ago and enjoyed wearing it so much that I wished I had made one sooner instead of waiting for a occasion to wear one. Every day should be a fairy skirt day! I would like to share the technique I used. 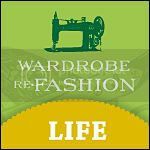 It’s a fairly quick and simple way of making a dress up skirt for children – or yourself – if you don’t like shop bought ones. You will need at least two layers of fabric cut into squares, roughly one metre squared will give you a length approximately to the knee on an adult. You can make the squares larger or smaller depending on how long you want the skirt to be and how wide your fabric is. 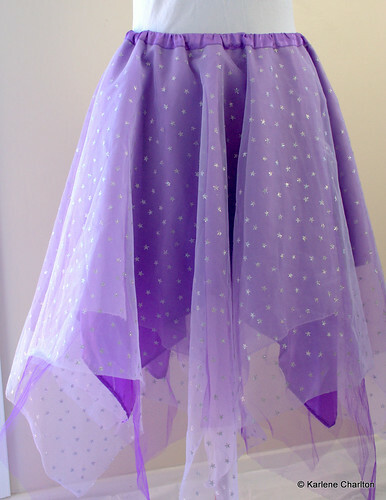 I used four layers, first – purple satin lining (goes on the bottom), second-mauve nylon organza, third-purple net/tulle, and fourth (top)-mauve organza with a sparkly star print. You can use whatever type of fabric you want,but I would recommend using something non-see through on the bottom. Layer the fabric on on your table or floor alternating between “square” position and “diamond”. Now you will need to cut a hole in the centre big enough to go over the hips. Hip measurement plus ease divided by 6.28 will give you the radius measurement to draw a circle with a compass, eg. hip measurement of 94cm plus 3 cm ease (97cm) divided by 6.28 equals 15.45cm, get a compass and set it to 15.45cm, draw a circle, and the circumference should be about 97cm. Use the circle as at template to centre over the squares/diamonds and cut hole. Ok, back up a bit. Before you lay your squares out, fold each one in half, then in half again to find the centre. You can then use the dot from the compass in the middle of your template to line up with the corner that is the centre of the square and cut through four layers, using a quarter of the template. Or you can fold/cut your template into quarters and place on top edge to edge, then cut. Do this for each layer. If you are very brave, or have a fancy cutting tool you could do all the layers together. Pins are allowed – just don’t hit them with scissors, they don’t like it. Make a casing for elastic by cutting a strip of fabric as long as the circumference of the circle plus 2cm seam allowance, approx 6cm wide, and stitch together. Cut elastic to fit waist measurement and join up, fold casing in half right sides out and attach to skirt with elastic inside. You could also just use some matching ribbing or knit fabric for a waistband, as long as it doesn’t stretch too much after sewing on to the skirt. We wouldn’t want our fairy to have her skirt falling down! Now add a pretty top, some wings and a wand and off you go. I might have a go at this – I have just 1 question – what is ease? “Ease” is the extra bit you add for comfort, movement and getting things on and off. If you made a straight skirt pattern for example, with the same measurement as your hip, you may have problems getting it over your bum – not to mention split seams if you try to sit down! Ok, I see. I assume the ease needed for a skinny 2 year old would be a lot less than 3cm then. Umm, lets see. A skinny 2 year old is probably bigger in the tummy than the hips, so you would use the waist measurement to start with. I’d still add the extra 3 cm to help get it on and off. Ease in adults clothing is usually about 4cm. fi i am making 4 of this costumes for halloween for 4 girls of the age of 14, how can I do them? they are for mext week!! I’m not sure exactly what you are asking. Just as the tutorial describes should be fine. If you have a more specific question about any problems I am happy to offer a suggestion. 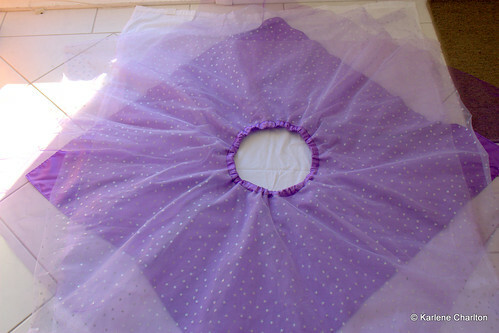 Hi Karlene, i was pleased to find your site and now can make fairy skirts for my grandaughters. Like you, i have a store of fabrics and love to make things. i had a pile of old scarves which i am making into fairy skirts. I have made 3 so far, the first being a disaster as the ends were uneven because they slipped being silk and chiffon type fabric. Now i firmly tack the inner circle before cutting around the template. Now i haunt fairs and op shops for scarves. Scarves are so ideal as they are edge finished and often with concentric patterns. and the long narrow ones can be incorporated as well on the outside. The skirts can be made reversible too. i have been making a casing in the old fashioned way but i think i will look for some wide coloured elastic (if there is such a thing) to make the process faster. I have taken photos of the second two skirts. Where can i put them to show you? perhaps you could email me. I will subsribe also.